Park Forest, IL–(ENEWSPF)–March 10, 2017. Earlier this month, 13 Rich East Business Professionals of America (BPA) members attended the 2017 BPA State Leadership Conference (SLC) in Oak Brook, Illinois. The event drew over 1,000 BPA delegates from 40 schools. 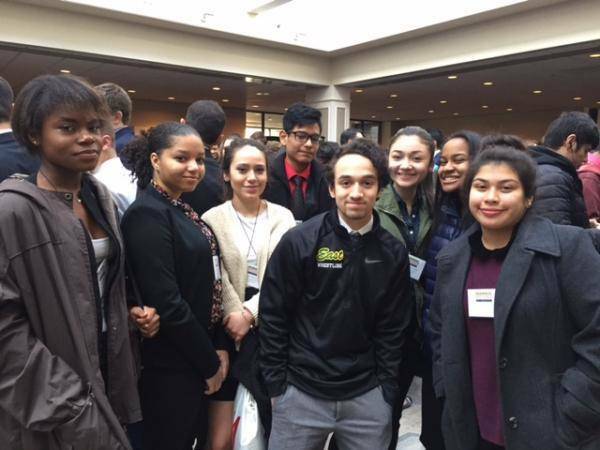 The participants from Park Forest’ Rich East High School included: Jessie Arevalo, Sam Tijerina, Connie Sanner, Mackenzie Ferrell, Carolina Mendia, Serah Umoren, Aaliyah Johnson, and Amilee Dorantes. The group reported having a wonderful experience and shared their appreciation for the opportunities that the BPA organization and District 227 have allowed them to take part in. “They were all wonderful student ambassadors for Rich East High School and District 227,” said Matthew Shank, a teacher and spokesperson for the school. Special congratulations to Amilee Dorantes and Aaliyah Johnson who were selected as Illinois Voting Delegates and will be representing Rich East High School at the 2017 National Leadership Conference, May 10-14, in Orlando, Florida. The two will also participate in the BPA Intern Program and compete in Open Events.